On November 14, I had the opportunity to join in on a discussion about education with my community. 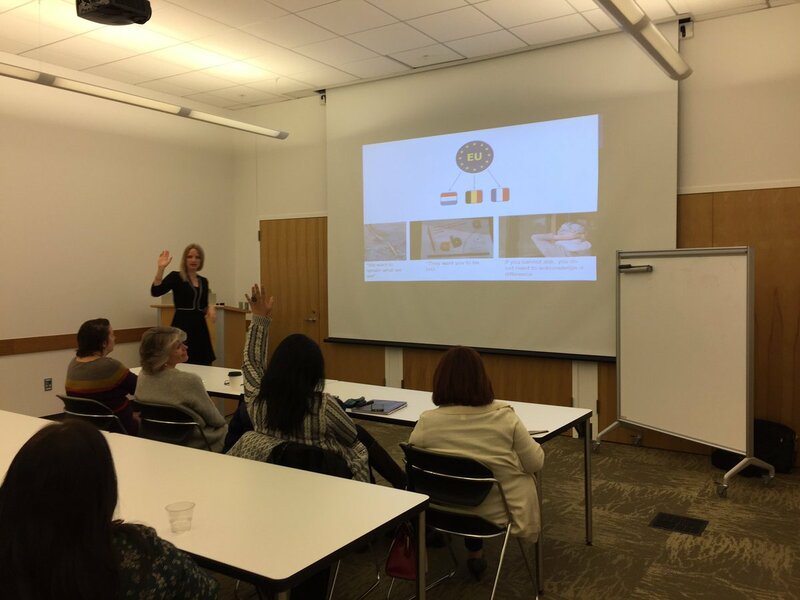 Letitia Zwickert, a Fulbright-Schuman Scholar and K-12 educator, visited the Champaign Public Library sponsored by the European Union Center and the Center for Global Studies along with the support of Illinois Humanities and the Illinois Speaks grant. During the event, Zwickert presented the research she conducted from January to June of 2016 on education in Belgium, Luxembourg, and France and how it specifically impacts migrant children and their families. Then she opened the floor to lively audience discussion and questions. The development of her research began in 2014 when Zwickert wrote a proposal to study minority languages and the best pedagogical practices in different locations; from there, she wanted to use that information to compare the information and use those to improve on teaching practices in different areas. She noted that she did not know if it would be possible to actually conduct her research, but with support from the European Union Center and the Center for Global Studies, she was able to successfully receive a Fulbright grant, and became the first K-12 educator who also was named a Fulbright-Schuman Fellow. In her research, she found that each of the countries she researched had different approaches to their education system; she was careful to present a full picture of the education systems, rather than presenting only negatives or positives about each system. She also discussed how the political and social landscape of the communities had an impact on what she observed. For example, her arrival in France was preceded by the Paris Attacks in December, and it shaped the discussions she had with government officials. During her research, she also visited Germany and Sweden, and she used her experiences there as comparisons to the information she collected in her research in Belgium, Luxembourg, and France. After exploring her pieces of advice, she opened the floor to questions, and the audience was actively engaged in conversation. This type of dialogue is what Zwickert wanted, as she noted that this event was meant to focus on discussion about education, and her research served as a point of discussion. In the end, Zwickert left the audience with a reflection on her research and the discussion. The components of her research are a global issue, and not just a local issue. We can consider our local viewpoint as a point of comparison, but we also should consider a global mindset as a point. It is important that we understand and care about people and take on a global mindset so we do not label people as "other."